I once wrote in an essay that I thought a certain journalism subject was vanilla. What the what? Seriously? Did I actually put pen to paper (or fingers to keyboard) to describe something I meant to call dull vanilla? My post university self is kicking my coffee-addled 3am brain from two years ago, whilst licking vanilla frosting from a coated spoon. Clearly at that point in my life, I still had a lot to learn. When discussing this cake with friends, so often the phrase ‘I love vanilla’ squealed from their lips, yet when do we ever appreciate the bean in its entirety? Only a few days ago I wrinkled my nose at a man at the cinema who eagerly asked for a scoop of vanilla ice cream. With so many flavour combinations and options to go for, why chose the simplest? Easy – it is often the simplest flavours that are the best. Whilst brainstorming flavour combinations for this cake – a birthday offering for my boyfriend – I envisioned crazy ‘out there’ ideas as my imagination grew wildly out of control. I may actually revisit these ideas at a later date, but for now the delicious simplicity of a cake studded with flecks of vanilla hints at a rapidly warming climate. The sort with a thick summer air that reminds me of crisp apples, citrus fruits and the warming notes of vanilla. This isn’t to say this cake is completely straightforward because of the simple flavour profile. I would hasten to add you should plan how you will whip up the batter, as you will need three large bowls and at the very least a handheld mixer with beaters and a balloon whisk attachment. I would also advise to cream the butter and sugar in the largest bowl you have, as this will be the bowl the meringue will be mixed in to, creating a large volume of cake batter. Aside from these notes, this is a fairly easy cake to master, and provides a light crumb that is complemented by bright bursts of berry sandwiched between the layers. For a summery twist, try substituting strawberries or raspberries but leave vanilla as the star. It may be simple, but this certainly isn’t a dull cake. 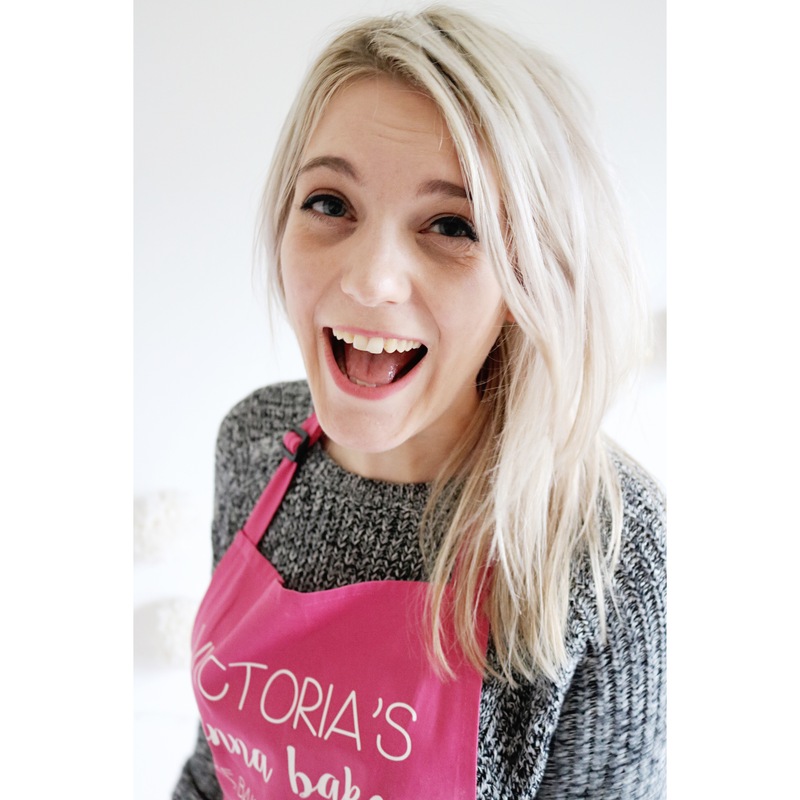 Preheat an oven to 170oc/150oc fan/Gas Mark 3. Grease and line three 20cm sandwich tins with baking parchment and set aside. In the largest bowl you have, cream together the butter and 300g of the caster sugar in a stand mixer or electric whisk until creamy. Beat in the four egg yolks one by one until the mix is light and airy. 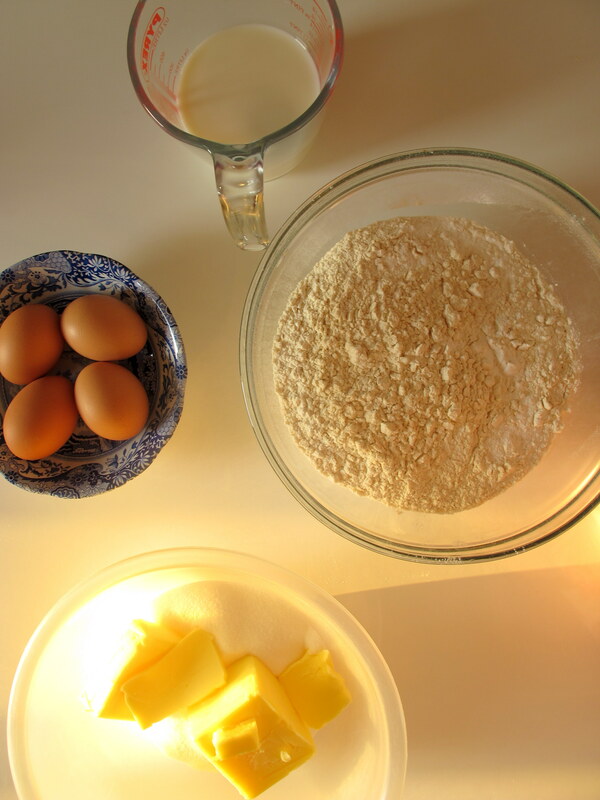 Whisk together the flour, baking powder and salt then add a third of the dry mix to the wet along with half the milk. Combine on a low speed, then repeat. Finish by folding in the remaining third of the dry mix. In a clean, dry bowl, whisk together the egg whites until soft peaks form. Add the remaining 100g of sugar then whip to stiff peaks. Cut a third of the meringue mix into the cake batter to loosen, then fold in the remaining egg whites, careful to not knock the air out of the batter. Divide between the three cake tins and bake for 30-35 minutes until a skewer inserted into the middle of each cake comes out clean. Remove from the oven and cool for 10 minutes, before turning out onto a wire rack and cooling completely. 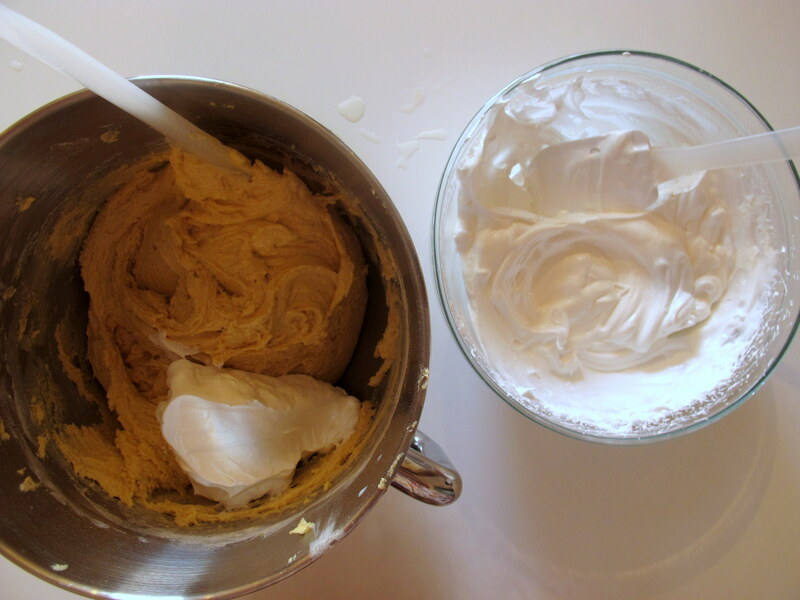 To make the frosting, whip the cream cheese in a stand mixer or with a hand held electric whisk until smooth. Add the softened butter then whip again. Beat in the icing sugar then mix in the vanilla paste. 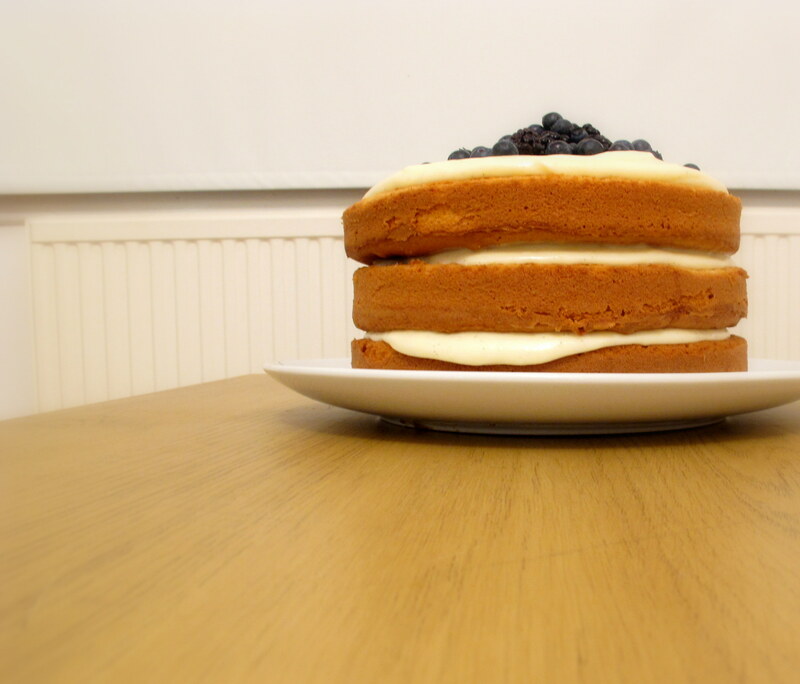 To assemble, place one cake on a stand or plate and smooth over a third of the frosting. 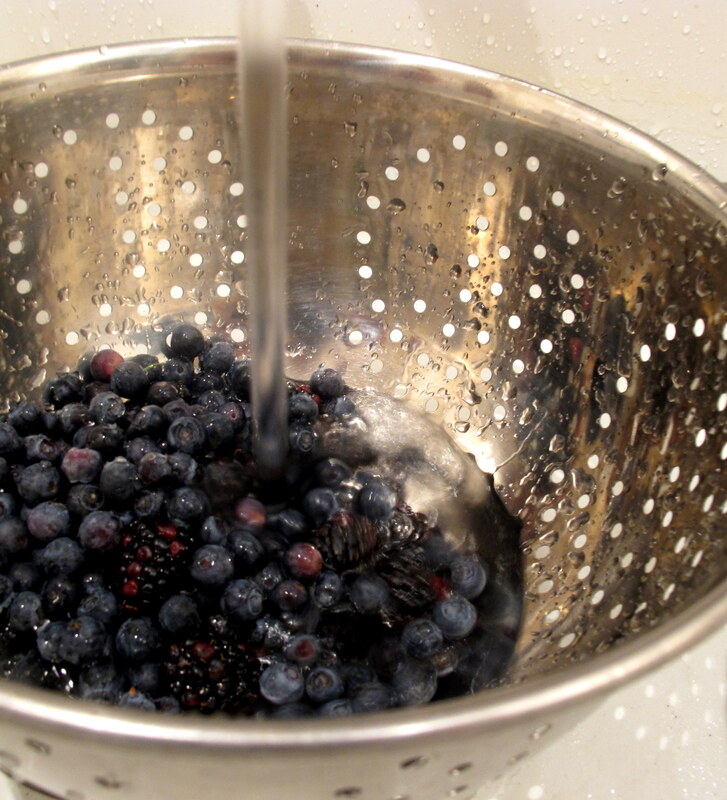 Sprinkle over a third of the berries then top with a second cake and repeat. 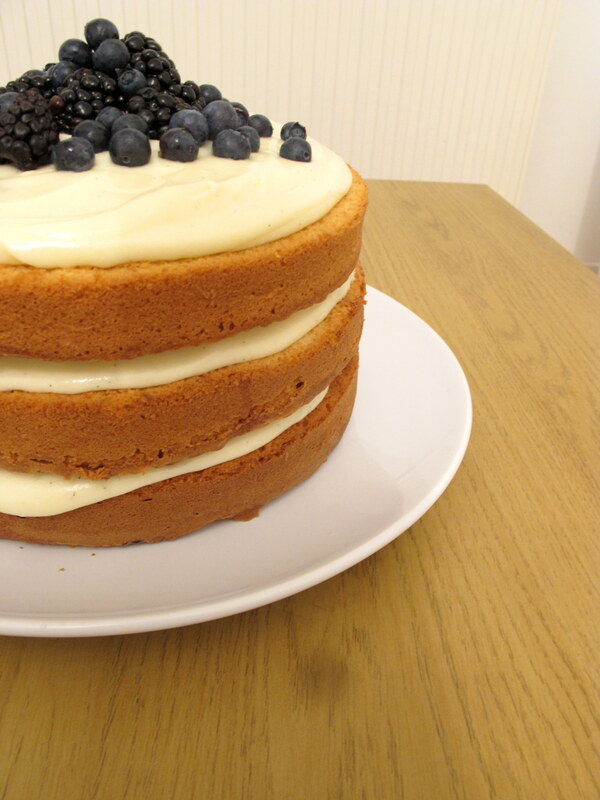 Place the third cake on top and smooth over the remaining frosting and pile the berries in the middle.